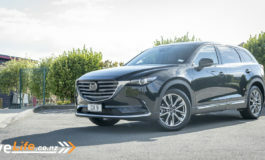 The whole CX range seems to be a winning recipe for Mazda; we love the CX-5, recently naming it “still the medium SUV King”, the CX-8 went down a treat with John, as did the CX-9 Takami. 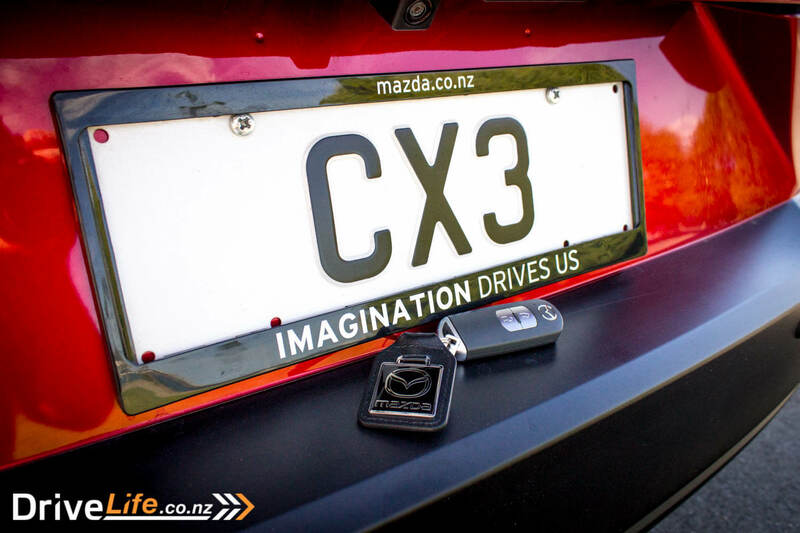 But what about the baby of the family, the CX-3? I must admit, it’s not a model I’ve spent much time with, but they sure are a popular small SUV, as you see them whizzing about the cities. 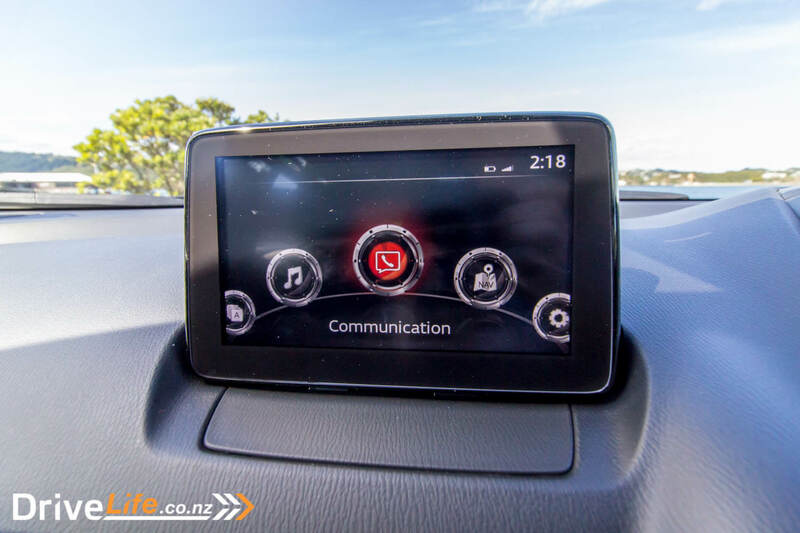 Mazda have given the CX-3 a bit of a facelift and a tech and mechanical boost; it now gains the excellent G-Vectoring Control (GVC) system for better ride and handling that its bigger siblings already have. But does this translate down? Can the CX-3 simply be a smaller CX-5, and just as good? Like the others in the CX range, you get to choose from four models; the entry-level GLX ($31,995), then the GSX ($36,995), the Limited ($40,195), and the top of the range, the ‘luxurious’ Takami ($41,695). 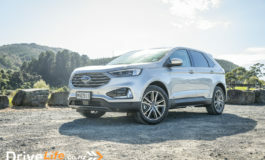 All models run the same engine and transmission, a 2.0-litre, 4-cylinder petrol engine that develops 110kW of power at 6,000rpm, and 195Nm of torque at 2,800rpm. All models run a 6-speed automatic. There’s just one all-wheel drive version of the CX-3 (the GSX AWD at $38,695) otherwise all are front-wheel drive. Thrown into the mix here is a ‘leather’ version of the GSX, called the GSX Leather ($38,295) and you guessed it – it has a leather interior, as well as a few other options (listed below). 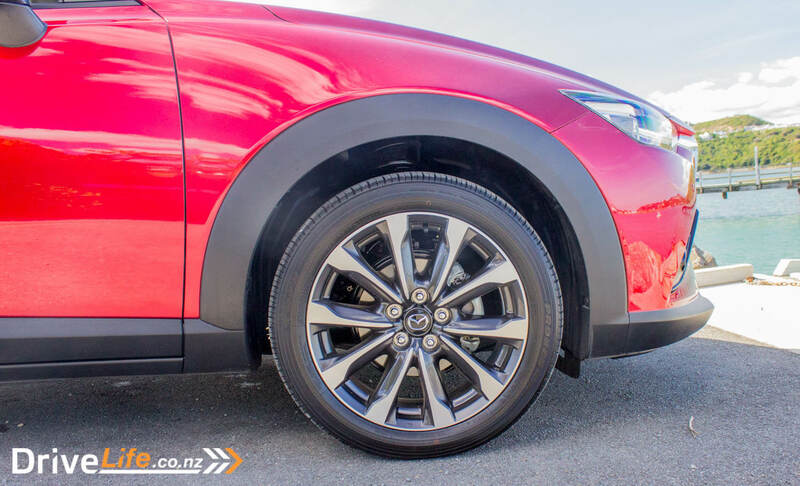 As far as updates go, there’s some new 18” alloy wheels for the CX-3 GSX, and all models new front and tail lamp design, piano black door and pillar garnish, and new dashboard decoration. 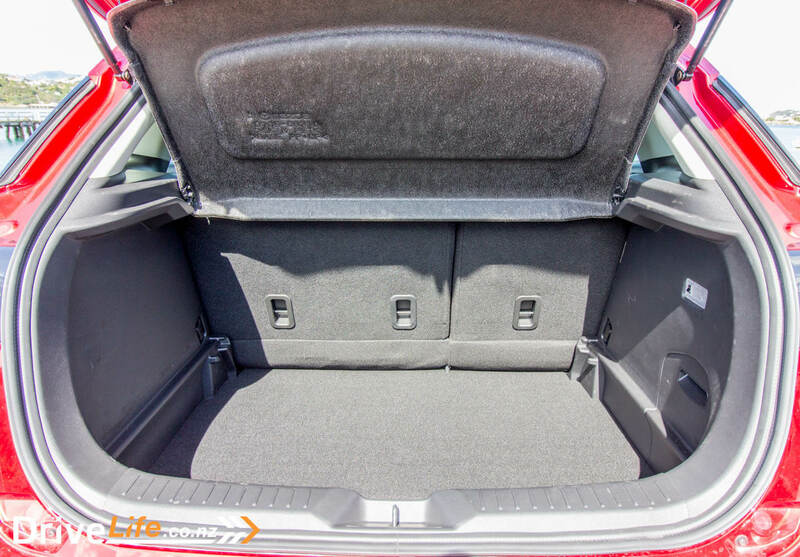 There’s been improvements in noise, vibration and harshness (NVH) by increasing the thickness of the front and rear door panels, rear doors glass and a denser headliner in the cabin. Base models are fitted with a reversing camera, 16” alloy wheels, Mazda’s i-ACTIVSENSE safety features like Advanced City Brake Support (Forward), blind spot monitoring, dual chrome exhausts, a roof spoiler, an electric park brake with autohold function, a 7” touchscreen display, 6-speaker audio, Internet Radio Integration (Stitcher, Aha), keyless entry and start, cruise control, traffic sign recognition, Smart City Brake Support Reverse, and hill start assist. You can add a couple of options to the LGX of SatNav and apple CarPlay/Android Auto capability. Moving up to the GSX model, there’s 18” alloys now, as well as LED headlamps, LED DRLs, LED tail lamps, automatic headlights, automatic wipers, power folding exterior mirrors, an Active Driving Display (a sort of heads-up display), climate AC, leather steering wheel and shift knob, SatNav, front and rear parking sensors, proximity keyless entry, and a fuller package of i-ACTIVSENSE Safety to add in Mazda Radar Cruise Control, Forward Obstruction Warning, Smart Brake Support, Smart City Brake Support (reverse), blind spot monitoring, rear cross traffic alert, traffic sign recognition and finally, Secondary Collision Reduction. If you want the GSX Leather, you get the full leather package along with heated exterior mirrors, heated front seats, 10-way power driver’s seat with 2 memories, side-sill garnish in silver, and a 2-position memory for the Active Driving Display. Still two models to go; the Limited will also give you privacy glass, a Premium 236-watt Bose sound system, an option of white or black leather, and some additional i-ACTIVSENSE items, namely adaptive LED headlights, lane departure warning and driver attention alert. Lastly, the Takami. 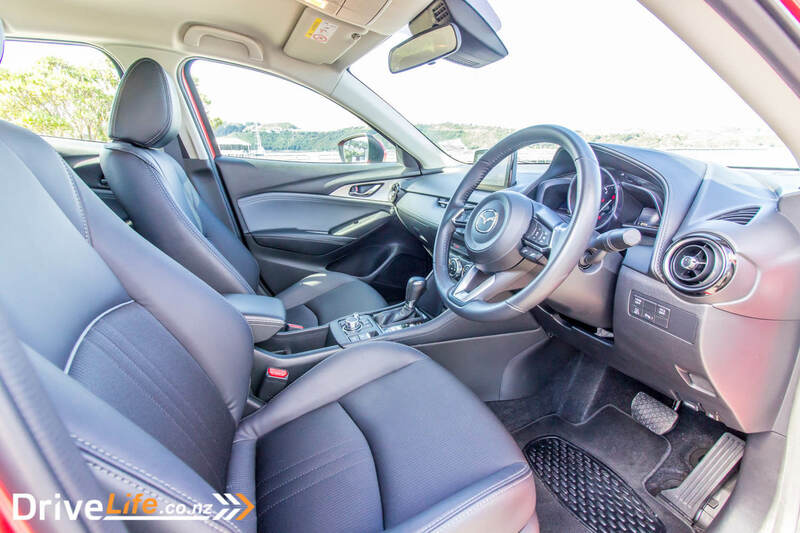 There’s different 18” alloys on this model, as well as ‘Aged Merlot Nappa leather’ trim, an automatic day/night mirror, an electric sunroof, and some different trim options. Note that if you do want the superb Soul Red Crystal, you’ll need to pay a premium of $300 – it’s worth it. If you are a grey kind of person, you can also fork out an extra $300 for a special kind of grey, called Machine Grey (replacing Meteor Grey Mica). When I went to pick up the test car, there was a dull grey CX-3 sitting there, ready to go. I could only wish it wasn’t that car, but was the CX-3 parked next to it in Mazda’s stunning Soul Red Crystal. And it was ‘my’ car. Pictures can’t explain just how great this colour looks; it looks excellent on the CX-5 and CX-9, and just as good – dare I say it, better – on the CX-3. 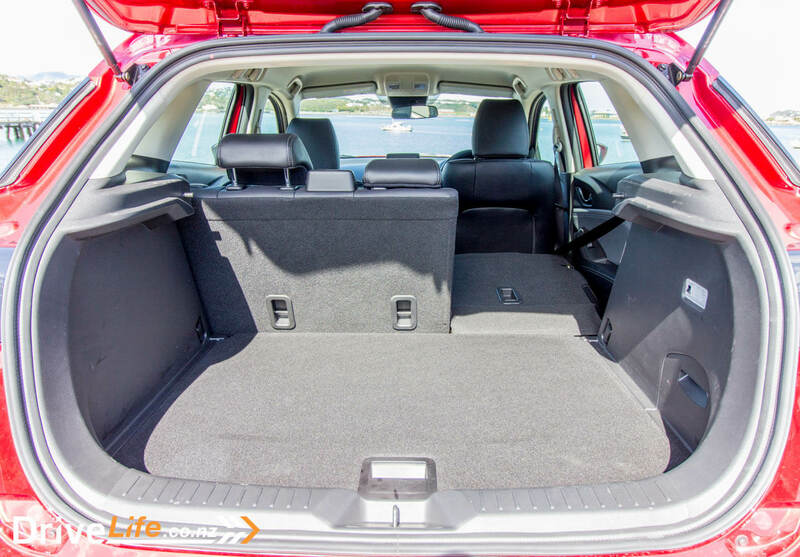 The proportions of this small SUV seem to suit Soul Red Crystal like no other colour. The front has had the latest family treatment, totally looking like a shrunken CX-5 now. 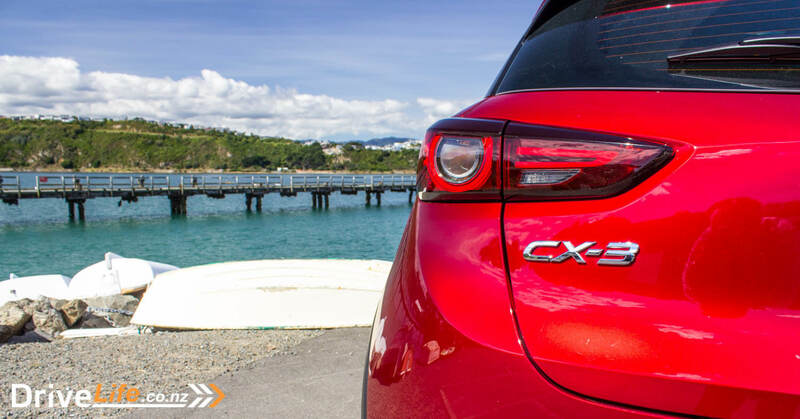 That’s no bad thing, either; the CX-5 is a stand-out in frontal design. It really does just look like a smaller CX-5, and I like it. Yup, shrunken CX-5 or 8 or 9. Total deja-vu moment, if you’ve driven any of the CX range. The car feels incredibly narrow when you are sitting in the driver’s seat; it’s not tiny, but it doesn’t seem that far to the left side of the car. Great that there’s ivory-coloured headlining, as the rest of the interior is black. The seats are a mix of cloth and leatherette, and look comfy enough. Since this is the GSX model, there’s a ‘sort of’ heads-up display (HUD), which is a piece of plastic that pops out of the dash when you turn the ignition on. More on that later. 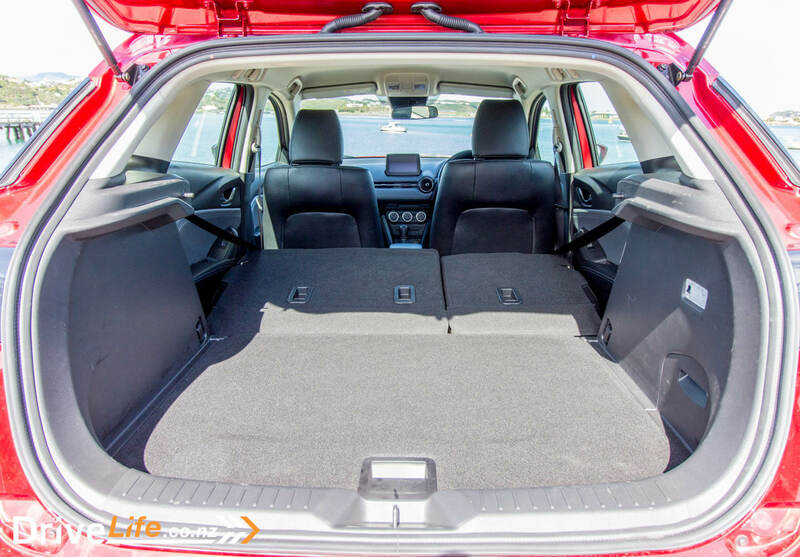 Even though this is their smallest SUV, there’s still some really nice materials used in the cabin. 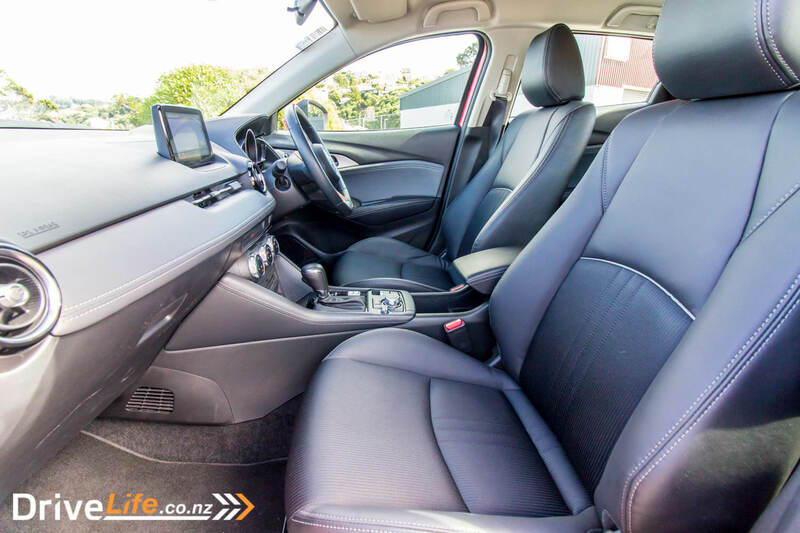 Still sitting in the driver’s seat, there’s padded leatherette on the dash, doors and console, and it looks great – classy and a little bit expensive-looking. The quality of the finish too is right up there; it looks well-built, with tight gaps around any joins. There’s a CD slot right there in the dash, which I don’t remember seeing on any other CX cars, but my wife liked that. In the centre-top of the dash, there’s a tacked-on display, it feels a little small at 7” but is in keeping with the size of the car. For your music and charging needs, there are 2 USB ports up front, as well as an AUX port and a 12-volt socket. Being a pretty small car, there’s no actual centre cubby in the CX-3, instead the arm rest lifts up to reveal an open sort of pocket thing, with two cup holders in front of that. 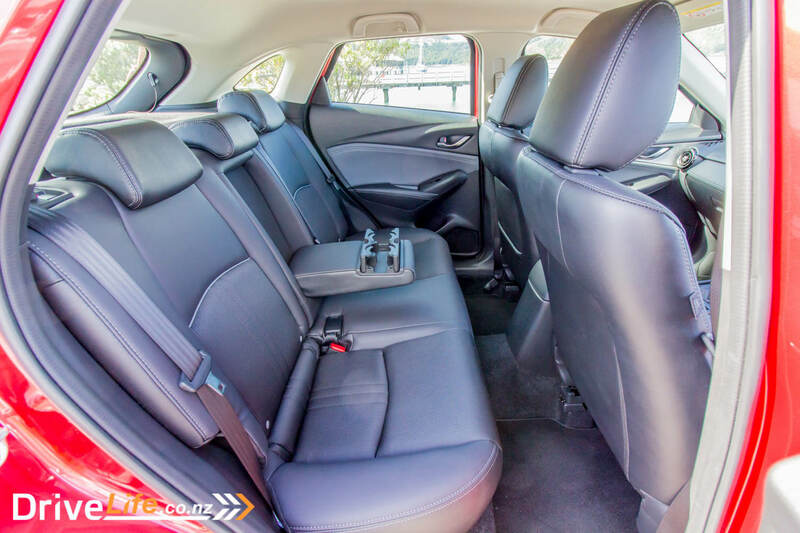 I was surprised at the amount of rear legroom in the CX-3. It looks a little tight, but I had a 6-foot something person in the passenger’s seat at one point, and there was still easily enough legroom for an adult passenger in the back seat. The boot isn’t huge at just 264 litres, but it’s par for the course when you have an attractive but space-sucking sloping rear end. It looks great, but it’s not boot-space friendly. One unfortunate item is the high loading height. 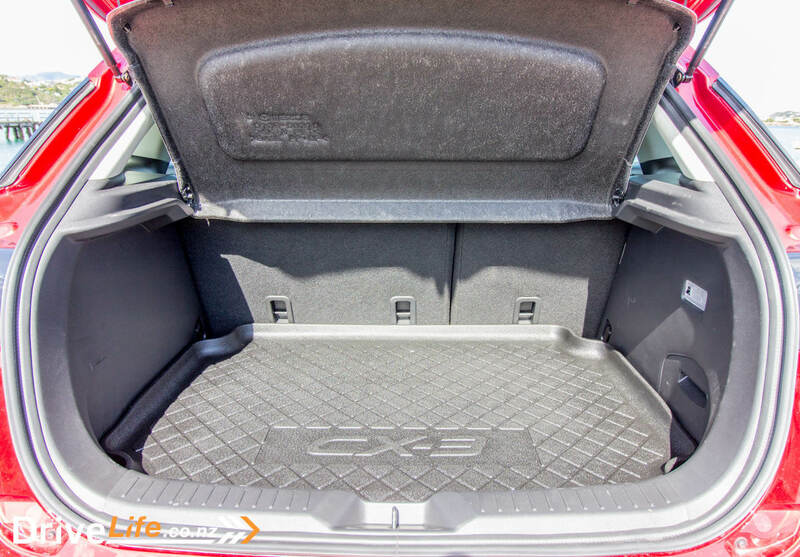 It’s a fair way up to lift anything into the boot of the CX-3. 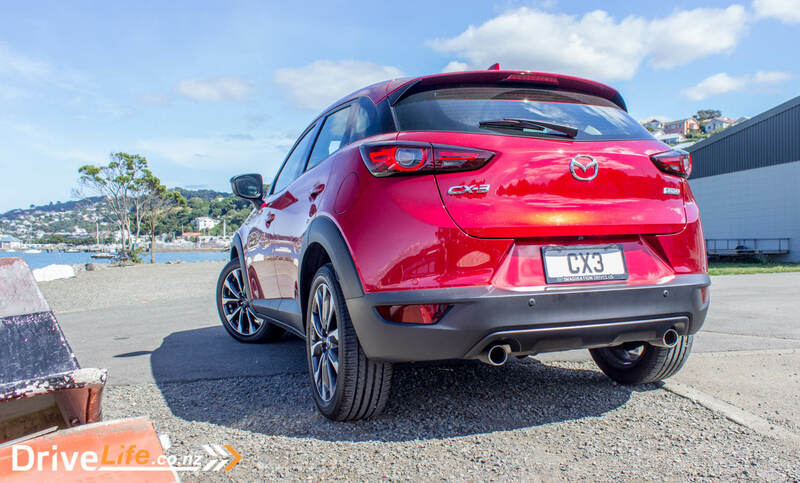 We’re used to modern petrol engines being fairly noisy on the outside at idle, and the CX-3 is no exception. I remember the CX-5 petrol sounded exactly the same (it has the same 2-litre engine but with slightly less power and torque). Still too early to call just yet, and this was with the windows down. Pulling away from the dealership, the narrowness of the car came into play – it’s a great around town car. 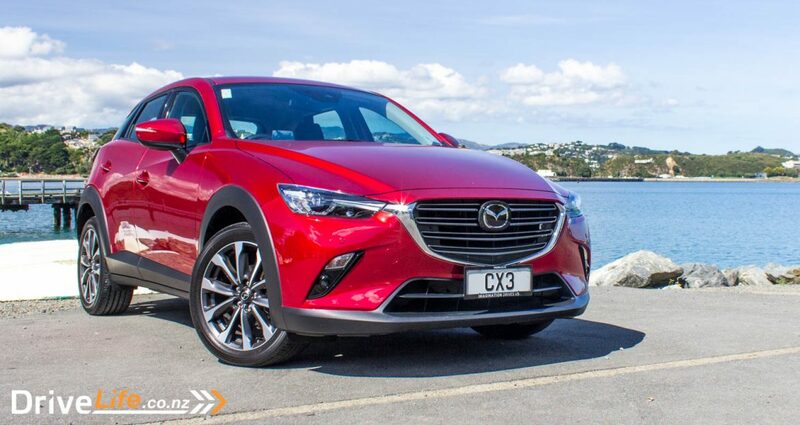 Over my week with the CX-3, I came to appreciate its lack of width more and more, as it zipped through Wellington’s tight streets without raising a sweat. A small drawback of this narrowness are the sun visors; since the car is narrow, so are the sun visors, and I did notice on the motorway sometimes they weren’t big enough to block out the sun. Sliding visors would be a perfect solution for this. 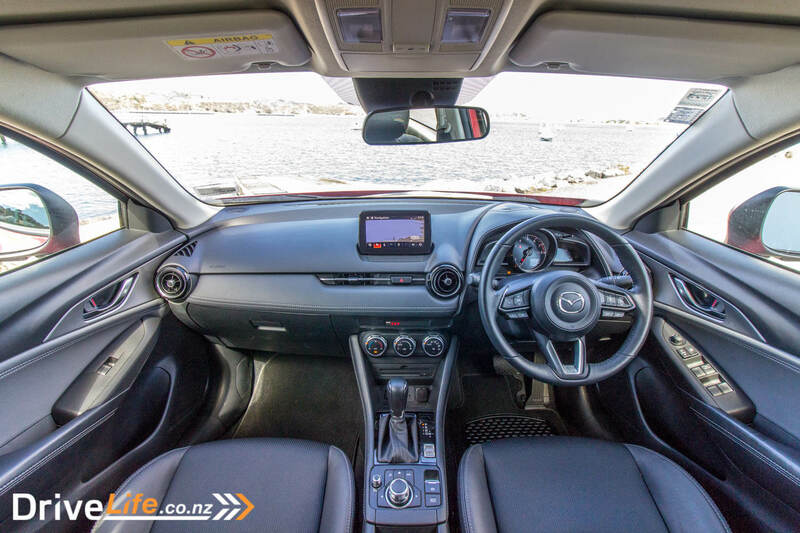 The GSX model is fitted with adaptive cruise control, and a huge round of thanks to Mazda New Zealand for making this move. There’s still far too many cars costing far more than the CX-3 GSX that don’t come with adaptive cruise control. Mazda calls their system Mazda Radar Cruise Control, but the generic term is adaptive cruise control, and it’s shorter to type. Mazda’s is one of the better ones, and the CX-3 is now fitted with stop/go functionality, so it will bring the car to a complete stop, and just a tap of the gas pedal will see it return to adaptive cruise control. This is great in stop-start traffic, and saves lots of stress, while you concentrate on steering and let the car do the rest. The HUD does the job, although I still prefer a ‘real’ HUD. While it sits too low to be as effective as a real HUD, that does mean that (for my height) the speed and other info is shown on the piece of plastic just below the lip of the bonnet, where it’s quite dark. This might not seem much, but HUDs that project onto the windscreen can be affected by bright sunlight sometimes. And it’s amazing what Mazda can fit on this HUD. 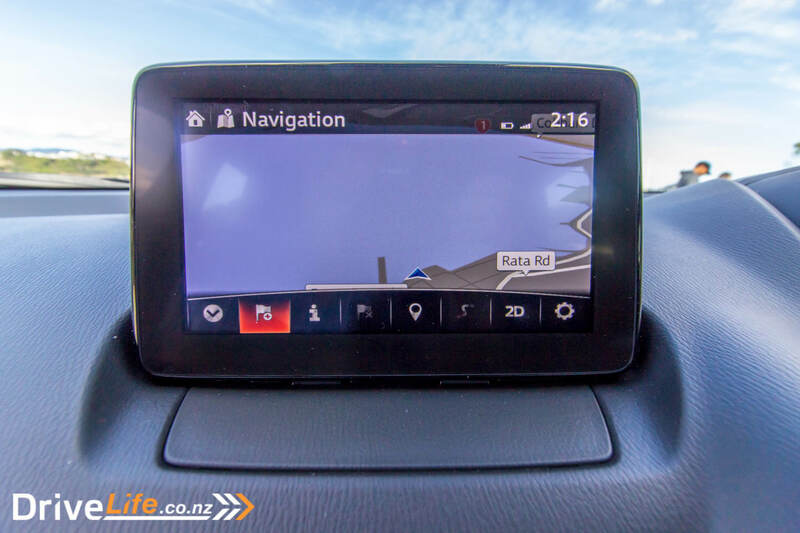 Your speed, the current speed limit, a warning of any cars in your blind spot, what speed you’ve set cruise control at, as well as the distance for spacing you’ve set the cruise control to – it’s all there, on a tiny piece of plastic. It’s quite impressive. 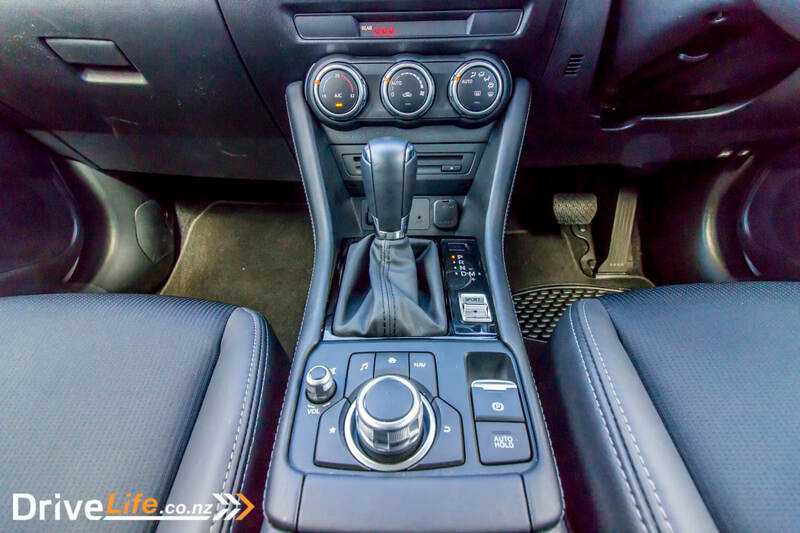 So with a 2-litre engine in this small SUV, you’d think it go like a pocket-rocket. Yes, and no. It can be ‘peppy’ but that’s as far as I’d go. 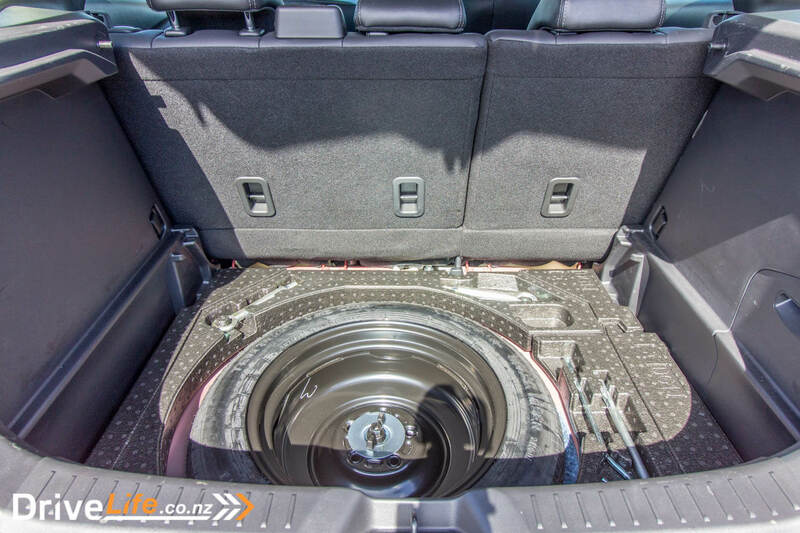 It still feels like a heavy car for its size – it weighs in at 1297Kg. Don’t get me wrong, stick it in Sport mode and it wants to go, and it doesn’t really feel like it’s ever wanting for more power, but it’s not the pocket rocket you might think it’d be, or that it looks like it should be. 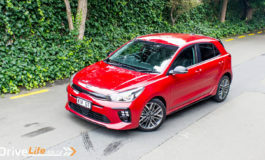 It’s got a good kick of torque at low revs, then it flattens out a bit around 3,000-4,000rpm, then it gets a second wind at 5,000rpm. It can move along nicely if you prod it, but it’s happier just tootling around town. There’s another reason it’s happier not being pushed along. Probably my biggest takeaway from the CX-3 was the engine noise. At cold idle, it sounds like a diesel. Once you get moving it’s better, but under load up any hill and the engine lets itself be known. On the motorway at cruising speeds and a steady throttle it’s fine, ditto plodding around town on the flat. But hills are not its friend, and brings out the engine noise. It’s the same if you plant the boot on an on-ramp and wind it out; it will go and pick up speed nicely, but it doesn’t feel good as the engine noise goes up as well. This is surprising, as Mazda have released the 2019 model with NVH improvements – but I’m not sure they’ve pulled it off. I did use the CX-3 in Sport mode a few times, but for me it felt like all it did was hold the gears longer and I didn’t want to do that. The low-end torque is plenty enough to avoid high revs. The Suzuki S-Cross with its 1.4-litre BoosterJet engine has it all over the CX-3 in this respect; the S-Cross is quick, quiet and silky smooth. Oh, to have that motor in the CX-3. Road noise can be a little high too, and it’s definitely not a CX-5 in that respect. The CX-9 is my large-SUV benchmark for cars in that price range for road and tyre noise, and the CX-3 is a mile away from that. It’s just not as refined as the other CX models, and I think this is where I felt a bit let down. I was expecting it to be the same. But I’ve got to keep in mind it is hard to make a smaller car quiet, and when they are it’s noticeable. Driving-wise, things are generally very good. There’s a big rev counter in the middle of the dash, with a smaller digital speedo. You don’t need a bigger speedo since you have the HUD. Visibility is good too, although the rear flanks are fairly high, and the window forward of the C-pillar is tiny. This is where blind-spot monitoring comes into its own. 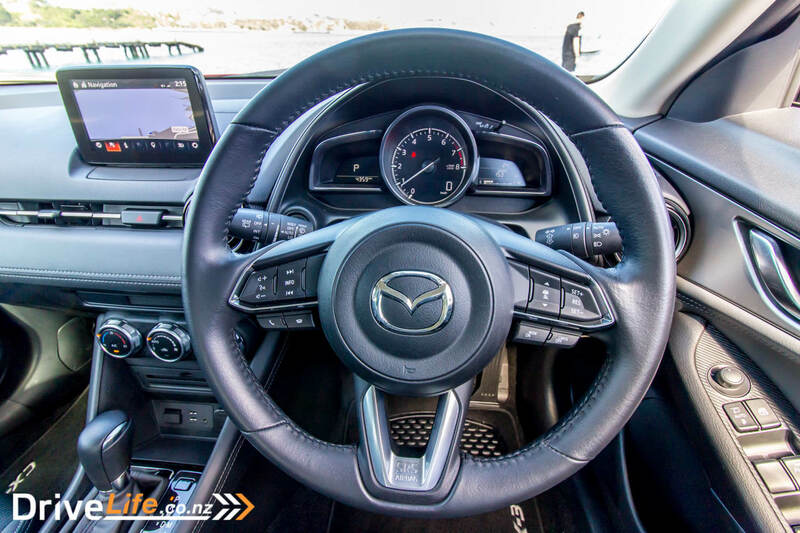 Mazda always brings decent steering wheel controls to the party, and the CX-3 is no exception. Standard Mazda fare, and they work well. After a short time, there’s no need to look down at the buttons anymore. Mazda’s G-Vectoring Control (GVC) is now a part of every CX-3. 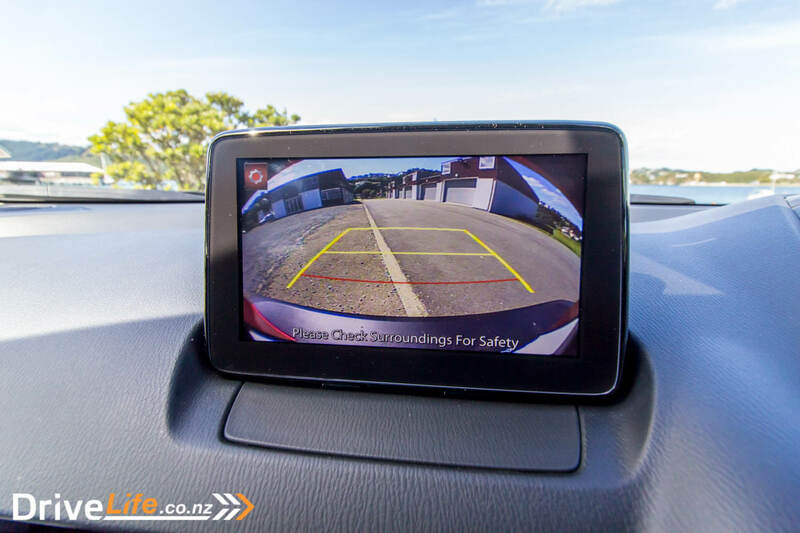 GVC links all the parts of the car that relate to driving – chassis, brakes, engine, transmission etc, and this linking enables the car to handle much better, as well as adding driving safety too. Does it work? On the CX-5 and CX-9, yes. You can really chuck those cars around, and they stick, and yes, they do handle. One of the other benefits of GVC is that your passengers don’t get thrown around in their seat as much, as GVC controls the car much better. So what about the CX-3 and GVC? Yes, it feels better than the previous model. I didn’t get the opportunity to test it out on one of my favourite roads, but overall you could feel this is a chassis that works. Mazda has done well to ensure GVC is being included in all its models. Fuel economy in the CX-3 over 500km worked out at 7.7L/100km. 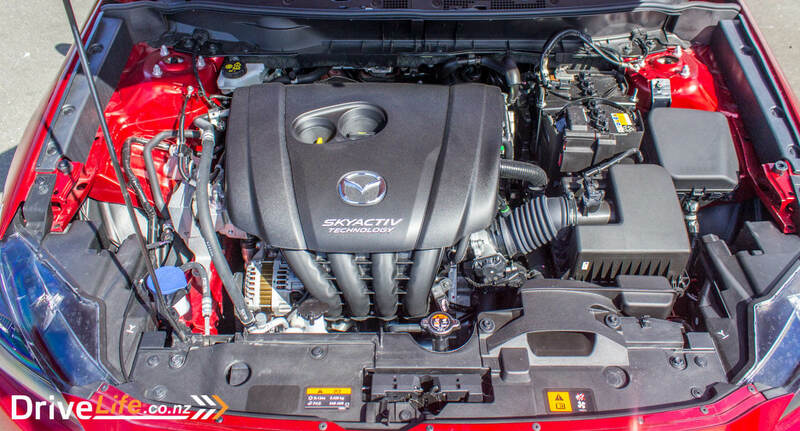 Mazda claims 6.3, so that’s pretty close. I’d hate to be in the market for a small SUV…so many choices. Mazda will sell the CX-3 on looks alone. Stick it in Soul Red Crystal, and it’s a stand-out car among others. It’s nicely finished with nice materials inside, drives well, and it’s a car you love to see in the car park. It’s a shame (for me) it’s let down by the amount of engine noise, and then road noise on certain surfaces. As I said, I’ve been spoilt with the refinement and NVH levels of the CX-5, CX-8 and CX-9; I expected the CX-3 to be the same. Then again, it’d be hard to find an unhappy CX-3 buyer. I feel confident to say most will be more than content with the car. How an earth to start this? I've been car/bike/truck crazy since I was a teen. Like John, I had the obligatory Countach poster on the wall. I guess I'm more officially into classic cars than anything else - I currently have a '65 Sunbeam Tiger that left the factory the same day as I left the hospital as a newborn with my mother. How could I not buy that car? Recently my wife and I drove across the USA in a brand-new Dodge Challenger, and then shipped it home. You can read more on www.usa2nz.co.nz I'm also an Observer for the Institute of Advanced Motorists - trying to do my bit to make our roads safer.